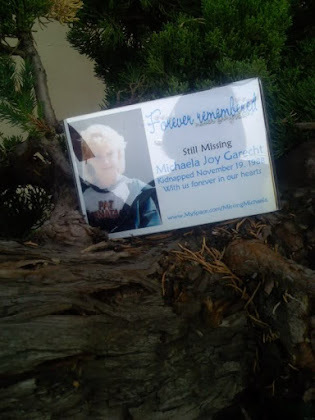 This blog is dedicated with love to my missing daughter, Michaela Joy Garecht. 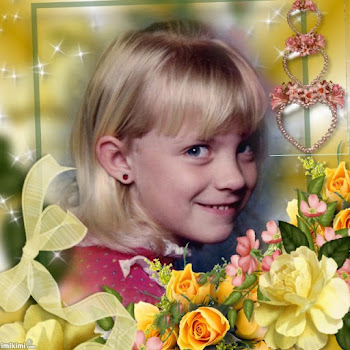 Michaela was kidnapped on November 19, 1988, at the age of nine, and she is still missing. I will never stop looking for her. I will never stop loving her. A song for you, Michaela. Caring and sharing. Don't you dare give up on this life. A lot of people care.. just keep fighting your way back home. 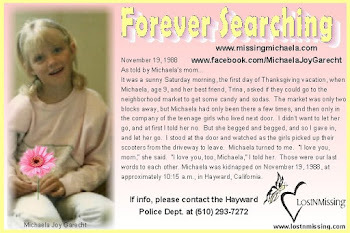 Please help us to find Michaela by asking your friends to post links to this blog on their social networking sites, especially those outside the United States. ابحث عنها. رجاء التراسل علا هاد الأميل إذ لديك خبر عنها. ميخاييلا احبكِ كثيرا!! ارجعي الا البيت! 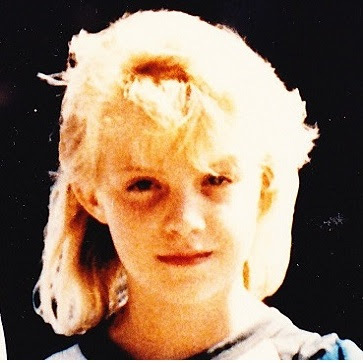 Michaela was the victim of a witnessed stranger abduction, on November 19, 1988, at age nine. (Her story is below.) If you have any information about Michaela, please email me at sharon.murch@gmail.com, or call Hayward Police Department at 1-800-222-3999 or 510-293-7079. "If ever there is a tomorrow when we're not together ... there is something you must always remember. You are braver than you believe, stronger than you seem, and smarter than you think. But the most important thing is, even if we're apart, I'll always be with you." From Christopher Robin to Winnie the Pooh. From my dear friend Chris Orrey to me. From me to Michaela, and to all my children. I love you all so much. Dedicated to my daughter, Michaela Joy Garecht. Kidnapped November 19, 1988 ... Still Missing. 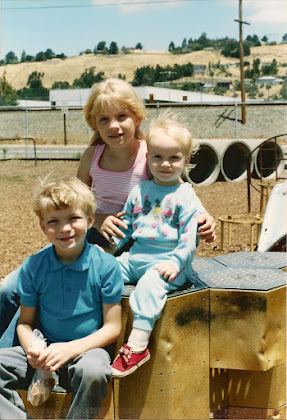 My daughter, Michaela, was kidnapped at the age of nine, on November 19, 1988. She and her best friend had ridden their scooters two blocks to the neighborhood market, to purchase some goodies. When they went in the store, they left their scooters by the door. When they came out, at first they forgot they had brought the scooters and started to walk home. Halfway across the parking lot they remembered, and turned back. One of the scooters was not where they had left it. Michaela spotted it first, a few parking spaces down from the door, next to a parked car. She went to get it, and when she bent over to pick it up, a man jumped out of the car, grabbed her from behind, threw her screaming into his car, and took off with her. The search for her has been massive and long. 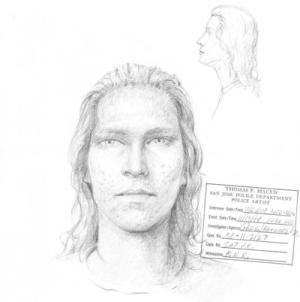 It has never become a cold case, but is very active with both the Hayward Police Department and the FBI. We have several very strong leads, but getting that final piece of information that will lead us directly to her has eluded us so far. I continue to believe that Michaela might still be alive, and that for any number of reasons she might be afraid to come home, and because of that, my mission is to keep reaching out to her, hoping she will see it and will know that she is loved. To Michaela ... there is nothing that could ever change our love for you -- nothing that you could have done, nothing that could have been done to you. We just want you to come home, and hold you safely in our arms, and if you have children, we will bring them safely home as well. Michaela, you are present with us, very much alive to us. You are a part of your family always, in everything we do, every gathering, every celebration, every small conversation in the kitchen. Michaela, my phone number is listed at the top of this column. 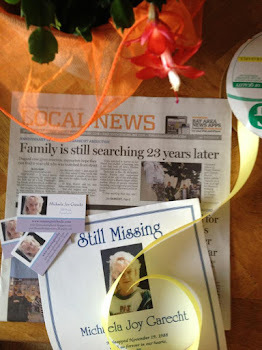 You can call me from anywhere in the world, or e-mail me at missingmichaela@gmail.com or sharon.murch@gmail.com, or you can leave an anonymous comment on this blog if you prefer, but please include some detail only you would know so that I can know it is you. And yes, Michaela, my name is different, but my love for you is the same, and so is your dad's and your brothers' and sister's. 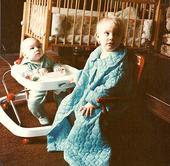 We have moved, but we are living in Nana's house, so it will not be a strange place to you. I love you forever, Michaela. Микаэла была похищена в возрасте девяти лет в 1988 году. Я - ее мама и я все еще ищу ее. Если у вас есть какая-либо информация о том, где она может быть, пожалуйста напишите мне сообщение на missingmichaela@gmail.com. Микаэла, если ты прочитаешь это, знай, что я всегда люблю и буду любить тебя что бы ни случилось. Пожалуйста возвращайся домой. Michaela a été enlevée à l'âge de neuf ans en 1988. Je suis sa mère et je suis toujours à sa recherche. Si vous avez des informations sur l'endroit où elle pourrait se trouver, s'il vous plait écrivez-moi à missingmichaela@gmail.com. Michaela, si tu lis ce message, sache que je t'aime depuis toujours et pour toujours, quoi qu'il arrive. S'il te plaît, reviens à la maison. "Michaela fue secuestrada a la edad de nueve años en 1988. Yo soy su mama y aun la estoy buscando. Si usted tiene información acerca de donde ella podria estar, por favor envieme un correo electronico amissingmichaela@gmail.com. Micahela, si tu lees esto, yo te amo siempre y por siempre, no importa lo que paso. Porfavor regresa a casa." Micahela, se stai leggendo questo, io ti amo sempre e ti amerò per sempre, non importa quanto tempo sia passato. Per favore, torna a casa." "Michaela wurde 1988 im Alter von neun Jahren entführt. Ich bin ihre Mutter und suche noch immer nach ihr. Falls Sie irgendwelche Informationen über Michaelas Aufenthalt haben, schreiben Sie bitte an missingmichaela@gmail.com. Michaela, falls du diese Nachricht hier liest sollst du wissen, dass ich dich für immer und ewig lieben werde, komme was wolle. Bitte, komm nach Hause zurück!" I am happy to share the words in this blog with others. If you want to share a brief quote, please be sure to include this blog as the source and include a link. I do maintain full ownership of these words and ideas and experiences as my individual intellectual property under United States copyright laws.